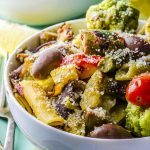 Light and healthy, our Spring Vegetable Pasta is a delicious bowlful of Spring vegetables, exotic Romanesco broccoli and purple asparagus, and gluten-free noodles in a white wine sauce. Heat the remaining 2 teaspoons of olive oil in the same skillet. Add the asparagus, scallions, zucchini and garlic and salt and cook over medium heat for about 4 minutes, tossing often .Add the grape tomatoes and continue cooking for 2 more minutes.